I thought I would have another go at the same scenario with the same ruleset to see how long it would take. The game took 3 hours over 2 sessions, with some referral to the Lasalle Forum. This is very good for solo wargaming. I also wanted to see if I could manage the French attack a little better. This time I planned on the same British defensive posture but a more cautious French attack with more reliance on artillery rather than immediate combat. Lets see how it goes. Both armies starting position can be seen here. Both armies advance toward each other, the 88th forms into march and advances through the 5th. The RFA unlimber. The British jockey their lines and the French form into march formation to speed their advance. The French artillery moves within canister range and unlimbers. The French veteran bde advances toward the British left and the 6e Dragoons start their move towards the 88th. RFA fire causing 1 DISR on the 6e Dragoons. The 88th forms line. The French cannon fire canister at the 88th causing 1 DISR. The French veteran bde forms into attack column as does the conscript bde. 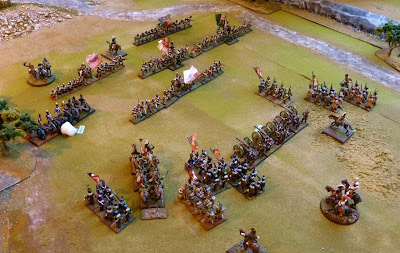 The 6e dragoons form into wave formation. The RFA fire causing further damage on the 6e dragoons. The 88th fire at the 25e causing DISR as does the 45th on the 1/66e ligne. Recovery tests fails. The French fire back without success. The 25e légere charge the 88th, so do the 1/66e on the 45th. The 6e Dragoons wheel and charge the RFA. The 2/66e forms line. The conscript bde changes their formation as well. The French artillery prolong toward the right of the British line. Multiple contact along the British line. The RFA decides to fire rather than seek refuge, no hits. The 88th falls back as a reaction. 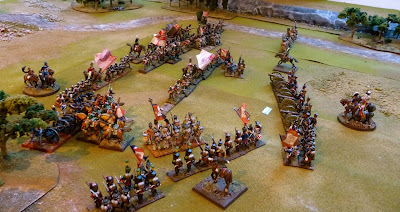 The RFA are broken by the 6e dragoons who fall back with 1 DISR. The combat between the 45th and the 1/66e is inconclusive with the 1/66e falling back 2BW and taking 1 DISR. The French press their attack with cannon fire, the 2/66e advance in line. The 1/66e charge the 45th again, as do the 25e légere on the 88th, "les grognards" are relentless. 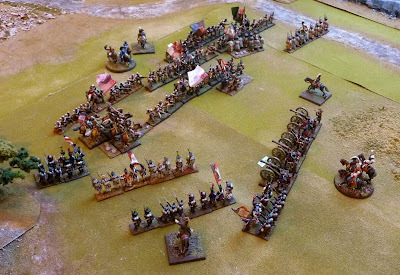 The 6e dragoons wheel and take the 88th in the flank. The 3/59e ligne advance towards the 5th. The 26e ligne form line. The 45th break the 1/66e. 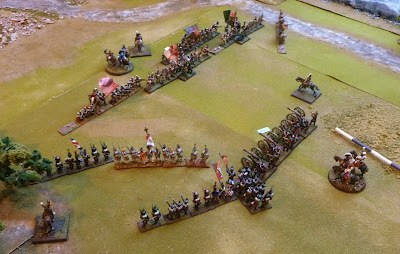 The 88th is unable to form square in reaction to the charge of the 6e dragoons. 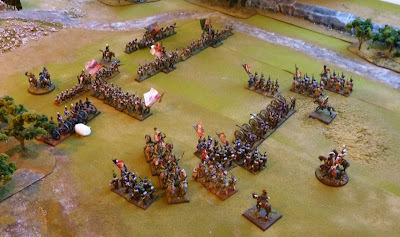 They first engage in combat with the 6e dragoons, then the 25e. The dragoons break and the 25e légere fall back with 1 DISR. The invincibility of the Devil's Own is again demonstrated. The 2/66e, artillery and the 25e fire at the British with success. The 26e and the 3/59e miss. The French adjust their formations and positions as seen below. The 25e légere, French artillery and the 26e ligne all are in line taking aim at the 88th, who have 3 DISR. Will the 88th stand! The 88th fire at the 25e and they break. The 2/66e loses 1 more DISR. The French in their first bonus turn fire their canister at the 88th and they finally break!! The 2/66e and the 3/59e cause DISR. The French artillery prolong towards the centre on the British line. French still have not reached their breakpoint, so no morale test. 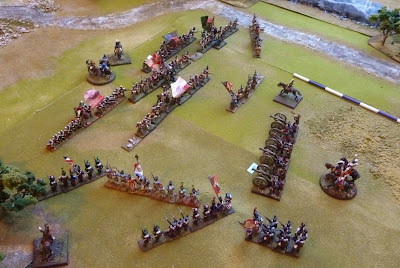 The 45th and the 5th cause damage to the forward French infantry. The British decide that it is best to attack the the French artillery, if the French keep on getting bonus turns the French advance will succeed. The 74th advance in line and the 94th make a flank move to cover the gap in the British centre. The British are at exactly 33% of their breakpoint, so no morale test. The French are again successful in their bonus die. Their units fire and all cause DISR to the forward British units. Die toss fails, game over. The French fail to capture Torrecastro, so a British victory but with cost. Much better game, maybe I should have increased the number of regular turns because of the size of the table as I think the French would have eventually won. I was much more comfortable with the rules this time. They are good!! Mais assez de Torrecastro. I agree with Ian... I am trying to get some spare time to fight Hagelberg with Lasalle! Thanks, time to get to painting. Excellent narrative - any thoughts forming about LaSalle vs Black Powder? From the description of the game I think I'll go ahead and pick up a copy of LaSalle - like miniatures, one really can't have too many sets of rules! Thanks Miles, I am hoping to have a look at the BP rules soon, I agree you can not have too many rulesets, but as you get older you sure do confuse them. I thought confusing multiple rulesets is how new rulesets get born! 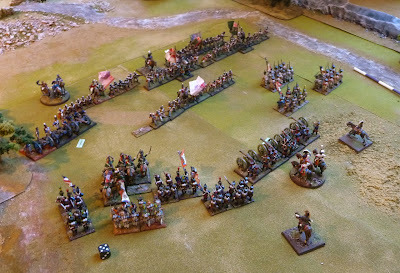 Hi John - the Lasalle battle report was a good write-up and accompanied by nice pics of the action. Be good to compare with the less structured (allegedly!) Black Powder. If you've got the time and don't mind a freeby - have a look at Pro Gloria & Pro Patria (http://home.exetel.com.au/millsy/canister/pro_rules.htm) which themselves evolved out of the initially rather good Elan (still also free as well I believe). A simple straight forward mechanism and reasonable historical accuracy seems to me to be what you want out of any rule set - and there certainly are enough to choose from! Thanks for the interesting and informative posts this year and Merry Christmas to you and yours. I'm enjoying your Blog and the making of your board and terrain, lovely river by the way. I have become a fan. Thanks secondus, you have a great blog.